Poke lovers, eat your heart out! Frolic Hawaii is bringing you the first-ever Honolulu PokeFest on Saturday, July 22 at Pier 11 on the edge of downtown Honolulu. Join us at the ultimate celebration of this iconic Hawaii dish and enjoy the freshest assortment of poke creations from 15 of our favorite local chefs and restaurants. The event is 21+. This is all-you-can-eat poke from the likes of MW Restaurant, Koko Head Cafe, Tanioka’s and more. We’re talking spicy king crab poke from Alicia’s Market, crunchy spicy ahi from Da Hawaiian Poke Co. and smoked salmon poke with cream cheese aioli, red onion and cucumber from Aloha Cones. 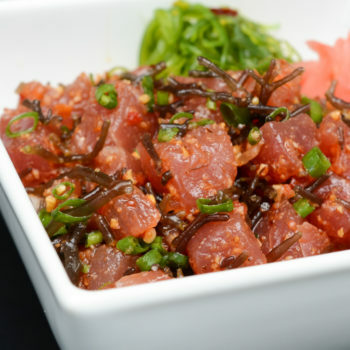 Ahi Assassins is making Lunatic Poke and Pake Poke. Forty Carrots at Bloomingdale’s, whose chef Jon Matsubara trained at three-Michelin-star Jean-Georges restaurant, is bringing Maui Nui venison poke with crispy sun chokes, inamona and umami mayo. Like that. Plus a toppings bar so you can add your own furikake, kimchee, taegu and whatever else your palate craves. Poke bowl lovers can pick up a rice bowl and dine around to create a custom bowl. There’ll be a no-host bar selling wine and ice-cold beer. And we’re giving away round-trip neighbor island tickets on Island Air and other gift certificates and prizes throughout the night. To support the programs that support our fishing industry, $5 from each ticket will benefit the Hawaii Seafood Council, a local non-profit that supports consumer education, outreach and research on responsible fisheries and sustainable seafood in Hawaii. Check them out at hawaii-seafood.org. General admission tickets are $60 + processing fee and include all food. VIP tickets are $100 + processing fee and include all food, two drink tickets, reserved seating and VIP parking. Frolic readers, enter promo code FROLIC5 at checkout and get $5 off your ticket! We only have a limited number of these promo codes, so get your tickets soon. Enter below with your name, email and phone number to win two VIP passes that include all food, two drink tickets, reserved seating and VIP parking! By entering, you allow us to send you Frolic newsletters and event announcements. No purchase necessary. Must be 21+ by July 22 to enter and a resident of the State of Hawaii. A random drawing for two pairs of VIP tickets will be held Friday, July 14 at 12 p.m. and winners will be contacted via email. Thank you! This contest is now closed.